Present-day Washington County borders MILWAUKEE and WAUKESHA counties to the south, OZAUKEE COUNTY to the east, Dodge County to the west, and Fond du Lac and SHEBOYGAN counties to the north. The area was under the legal jurisdiction of Milwaukee County until 1839. After separating from Milwaukee County, Washington included land that is now part of Ozaukee County. Conflicts over where to place the county seat were ultimately resolved by division into two counties. When the Wisconsin legislature made Washington County a separate legal entity in 1853, WEST BEND became the county seat. Today, Washington County measures twenty-four miles from north to south and eighteen miles from east to west. It encompasses twenty municipalities: two cities, six villages, and twelve towns. Additionally, the County contains several unincorporated hamlets and a small portion of the CITY OF MILWAUKEE. Washington County’s government leadership includes elected supervisors from each of twenty-six districts and an appointed County Administrator. Following the U.S. Public Land Survey and land cessions made in 1833 by the Ojibwe, Ottawa, and POTAWATOMI, property in Wisconsin became available for sale beginning in 1835. Beginning in the 1830s, settlers in Washington County included YANKEES—predominantly from New York and Ohio—IRISH, and NORWEGIANS. The majority of those purchasing land were GERMAN. Agriculture quickly emerged as Washington County’s central industry and continues to play a significant role in the local economy. While grain was the major output at the turn of the twentieth century, dairy and stock farming were also important enterprises. In 1858 the Washington County Agricultural Society hosted the first County Fair in West Bend. The event showcased the variety of goods produced by local farmers. Waterways, and later, RAILROADS spurred the development of Washington County. Early inhabitants initially made their homes along river banks, constructing WATERMILLS and dams to harness the power of the running water. In sawmills, lumber felled to clear land for farming was cut into usable boards; in gristmills, grain grown on cleared farmland was processed into flour. Local residents used and sold both final products. Beginning in the mid-1850s, the railroad allowed Washington County’s residents to sell these products and engage commercially with a market expanding beyond its boundaries. Railroads inspired both residential growth and municipal incorporation. For example, the Village of KEWASKUM incorporated in 1895 after the arrival of the Chicago and North Western Railway. On the other hand, hamlets without railroad stops usually did not incorporate because they did not develop as commercial centers. St. Kilian, Wayne Center, and Kohlsville all remained small, unincorporated hamlets within the Town of WAYNE. After the majority of the land in the county was parceled, sold, and settled, the population of Washington County remained relatively stable for nearly a century. The population grew only marginally, from 23,622 in 1860 to 28,430 in 1940. Many municipalities, including ERIN and FARMINGTON, did not meet or exceed their 1860 populations until well into the twentieth century. But after World War II, the population of Washington County grew at an unprecedented rate, gaining between twelve and forty percent more residents each decade. Improved roads facilitated travel both within and outside Washington County in the late 1940s. Major thoroughfares, such as the north-south State Highways 41 and 45, whose construction began in the early part of the 1900s, connected Washington County to the surrounding region and beyond. The expansion of the road system made it easy to for Washington County residents to commute to urban areas such as Milwaukee for work and entertainment. As early as the 1960s, many longtime Washington County residents criticized the parcellation of historic farmland for residential development. At its peak in 1880, Washington County hosted 3,075 farms. 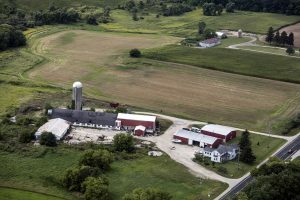 From that point, the number of farms in the County hovered in the high two thousands until a marked decrease in the number of farms beginning in the mid-twentieth century. By 1987, fewer than one thousand farms remained in the County. While much of the former farmland has been repurposed for residential development, several other factors, including the preservation of relatively large tracts of land for public use, implementation of federal policies, and the changing face of agribusiness have also contributed to this trend. As Washington County’s population continued growing into the twenty-first century, concerns related to SUBURBANIZATION have arisen. This includes negotiating ANNEXATION issues as well as balancing the call to preserve the rural landscape with providing residential development opportunities and municipal services for a growing population. Shaped by the encroachment, receding, and melting of a giant ice sheet nearly 20,000 years ago, the land in Washington County is part of the KETTLE MORAINE. This process created the steeply-sloping hills, valleys, and small lakes that characterize the region’s topography and deposited material in its movement, giving Washington County large gravel pits. This resource has served in the construction of new roads as well as residential and commercial subdivisions. Washington County is home to twenty-six entries on the National Register of Historic Places. The majority of the entries are examples of domestic, commercial, or ecclesiastical buildings; the list also features several historic districts within Hartford. A notable inclusion is HOLY HILL, a minor basilica of the Roman Catholic Church, located within Erin. 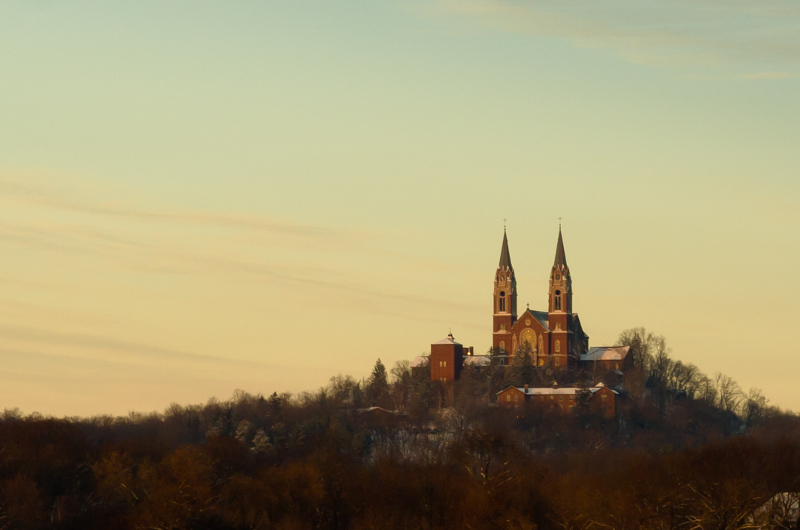 Constructed in phases beginning in the mid-1800s and completed in 1931, Holy Hill is perched atop one of the highest points in the County and attracts more than 500,000 visitors annually. Several facilities seek to preserve the County’s natural landscape and wildlife habitats and facilitate outdoor recreation. 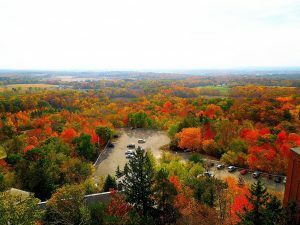 Kewaskum contains more than three thousand acres of the Northern Unit of the Kettle Moraine State Forest. The Eisenbahn State Trail begins in West Bend and extends northward through Kewaskum and into Fond du Lac County. A twenty-five mile converted railroad corridor, it is the longest bikeway in the County. Located within Farmington, Lizard Mound County Park is part of the Washington County “Island” Effigy Mound District. It preserves a Native American burial site. Hiking trails weave through the effigy mound system, which were constructed around the second half of the first millennium CE. There are also several wildlife and conservation areas within the County, including the Allenton Marsh Wildlife Area in Addison and the Jackson Marsh Wildlife Area. ^ Carol K. Kirchmayer Janzen, “The Urban Advance and Rural Retreat in Washington County, Wisconsin” (MA thesis, University of Wisconsin-Milwaukee, 1995), 13. ^ Acts and Resolves Passed by the Legislature of Wisconsin, in the Year 1850: Together with Memorials to Congress (Madison, WI: David T. Dickson, State Printer, 1850), 75-78; Western Historical Company, History of Washington and Ozaukee Counties, Wisconsin (Chicago, IL: Western Historical Company, 1881), 341. ^ Janzen, “The Urban Advance and Rural Retreat in Washington County, Wisconsin” 9. ^ Southeastern Wisconsin Regional Planning Commission, A Comprehensive Plan for the Town of Erin: 2035 (Waukesha, WI: Southeastern Wisconsin Regional Planning Commission, 2009), 2. ^ County Board, Washington County website, accessed February 23, 2018. ^ Nancy Oestreich Lurie, Wisconsin Indians (Madison, WI: The Wisconsin Historical Society Press, 2002), 7; Western Historical Company, History of Washington and Ozaukee Counties, Wisconsin (Chicago, IL: Western Historical Company, 1881), 221, 324; Janzen, “The Urban Advance and Rural Retreat in Washington County, Wisconsin,” 15. ^ Western Historical Company, History of Washington and Ozaukee Counties, 445, 450-454; Robin Buchmeier and Sally Stapleton, 150th Anniversary Commemorative, Erin Township, Washington County, Wisconsin (Erin, WI: Erin Anniversary Committee, 1996), 43, 157, 168. ^ Western Historical Company, History of Washington and Ozaukee Counties, 371-372. ^ For a brief primer on the development of the railroads in Wisconsin, see “Turning Points in Wisconsin History: Development of the Railroads,” Wisconsin Historical Society, accessed April 7, 2016. ^ The Village of Kewaskum obtained a stop on the Chicago and North Western Railway, which linked Milwaukee to Fond du Lac. Western Historical Company, History of Washington and Ozaukee Counties, 437-8. ^ Winding through the Town of Wayne: 1848-1998 150th Anniversary (Town of Wayne, WI: n.p., 1998), 53; Southeastern Wisconsin Regional Planning Commission, A Land Use Plan for the Town of Wayne: 2020. (Waukesha, WI: Southeastern Wisconsin Regional Planning Commission, 1999), 2-3; “Turning Points in Wisconsin History: Development of the Railroads,” Wisconsin Historical Society, accessed April 7, 2016. ^ Janzen, “The Urban Advance and Rural Retreat in Washington County, Wisconsin,” 20-21. ^ Population of the Town of Erin in 1860: 1,445; Population of the Town of Erin in 1970: 1,641. Population of the Town of Farmington in 1860: 1,885; Population of the Town of Farmington in 1980: 2,386. Janzen, “The Urban Advance and Rural Retreat in Washington County, Wisconsin,” 25-28. ^ “Highways 40 through 49,” Wisconsin Highways, accessed April 2, 2016. ^ Janzen, “The Urban Advance and Rural Retreat in Washington County, Wisconsin,” 37. ^ “Town of Erin: Schwulst Denies Subdivision Claims,” The Milwaukee Sentinel, March 31, 1969; Luke Klink, “Some Richfield Homeowners Express Displeasure over Proposed Subdivision,” Milwaukee Journal Sentinel, March 3, 2000; Walter Fee, “The North: Farms Become Subdivisions,” The Milwaukee Journal, March 5, 1978. ^ Janzen, “The Urban Advance and Rural Retreat in Washington County, Wisconsin,” 71, 97. ^ From 1990 to 2010, census data indicate that Washington County’s population grew by almost forty percent, from 95,328 to 131,887 residents. “Quick Facts: Washington County, Wisconsin,” United States Census Bureau, accessed April 2, 2016; Southeastern Wisconsin Regional Planning Commission, A Comprehensive Plan for the Town of Erin: 2035 (Waukesha, WI: Southeastern Wisconsin Regional Planning Commission, 2009), 24. ^ “Kettle Moraine State Forest—Northern Unit, Geological History,” Wisconsin Department of Natural Resources, accessed March 31, 2016. ^ Janzen, “The Urban Advance and Rural Retreat in Washington County, Wisconsin,” 11. ^ For comparison, as of March 2016, the entire State of Wisconsin holds 2,392 entries in the National Register of Historic Places; of these, Milwaukee County holds 243, Ozaukee County holds 36, and Waukesha County holds 152. “Search Results: Wisconsin,” National Park Service, accessed March 31, 2016; “Search Results: Wisconsin, Milwaukee,” National Park Service, accessed March 31, 2016; “Search Results: Wisconsin, Ozaukee County,” National Park Service, accessed March 31, 2016; “Search Results: Wisconsin, Waukesha County,” National Park Service, accessed March 31, 2016. ^ “Search Results: Wisconsin, Washington County,” National Park Service, accessed March 31, 2016. ^ Peter-Thomas Rohrbach, Journey to Carith: The Sources and Story of the Discalced Carmelites (Washington, D.C.: ICS Publications, 2015), 335; “Holy Hill, National Register of Historic Places Registration Form,” National Park Service, accessed November 19, 2015; “Home,” Holy Hill website, accessed November 20, 2015. ^ “Home,” Village of Kewaskum website, accessed September 29, 2015; Southeastern Wisconsin Regional Planning Commission, A Comprehensive Plan for the Town of Kewaskum: 2035. ^ “Wisconsin State Park System: Eisenbahn State Trail,” Wisconsin Department of Natural Resources, accessed March 31, 2016; Southeastern Wisconsin Regional Planning Commission, A Comprehensive Plan for the Town of Kewaskum: 2035 (Waukesha, WI: Southeastern Wisconsin Regional Planning Committee, 2009), 11, 113. ^ Southeastern Wisconsin Regional Planning Commission, A Comprehensive Plan for the Town of Farmington: 2035 (Waukesha, WI: Southeastern Wisconsin Regional Planning Commission, 2010), 81-82; Dean R. Snow, “Lizard Mound,” Archaeology of Native North America (New York, NY: Routledge, 2010), 109; “Lizard Mound State Park, National Register of Historic Places Inventory—Nomination Form,” National Park Service, accessed November 18, 2015. ^ Southeastern Wisconsin Regional Planning Commission, A Comprehensive Plan for the Town of Addison: 2035 (Waukesha, WI: Southeastern Wisconsin Regional Planning Commission, 2009), 64; “Jackson Marsh Wildlife Area,” Wisconsin Department of Natural Resources, accessed September 8, 2015; “Jackson Marsh,” Wisconsin Department of Natural Resources, accessed September 8, 2015. Janzen, Carol K. Kirchmayer, “The Urban Advance and Rural Retreat in Washington County, Wisconsin.” MA thesis, University of Wisconsin-Milwaukee, 1995. Quickert, Carl. Washington County, Wisconsin: Past and Present. Chicago, IL: S.J. Clarke Publishing Company, 1912. Southeastern Wisconsin Regional Planning Commission. A Comprehensive Plan for the Town of Kewaskum: 2035. Waukesha, WI: Southeastern Wisconsin Regional Planning Commission, 2009. Western Historical Company. History of Washington and Ozaukee Counties, Wisconsin. Chicago, IL: Western Historical Company, 1881.